We’ve got a bit behind on our regular schedule – there’s too much going down to keep up with everyone’s requests – so this update for October is a week late and we’ve decided to skip the 1-click survey this month. Here’s some of what’s gone down. Hats off to ChargeNet NZ! Several Flip the Fleet participants attended the Hare & The Turtle event in Cromwell in September. ChargeNet NZ has just refunded the cost of rapid charging for them to get there and make it such a success. They also funded Sean Ogden to bring the Tesla X down to drag off the Highlands’ Ferrari (3 nil to Tesla!). All up then, ChargeNet NZ supported the event to the tune of around $8,000. Aren’t they the best?! There is interest in what impact EVs will have on the electrical grid in NZ. Vasily Levshin has developed a smart EV black box (https://flipthefleet.org/ev-black-box/) that, amongst numerous other things, can tell us exactly when a car is charging and how much power it is taking. Over the next few months, researchers at the Centre for Sustainability from the University of Otago (https://www.otago.ac.nz/centre-sustainability/index.html) will be analysing anonymised charging data collected from these EV black boxes to understand how people charge their EVs. As examples of what charging patterns can look like, in Figure 1 we show the charging patterns of Daniel, Dima, and Henrik. A big thanks to EECA and PSP for funding the rollout of these devices so we can collect this data. 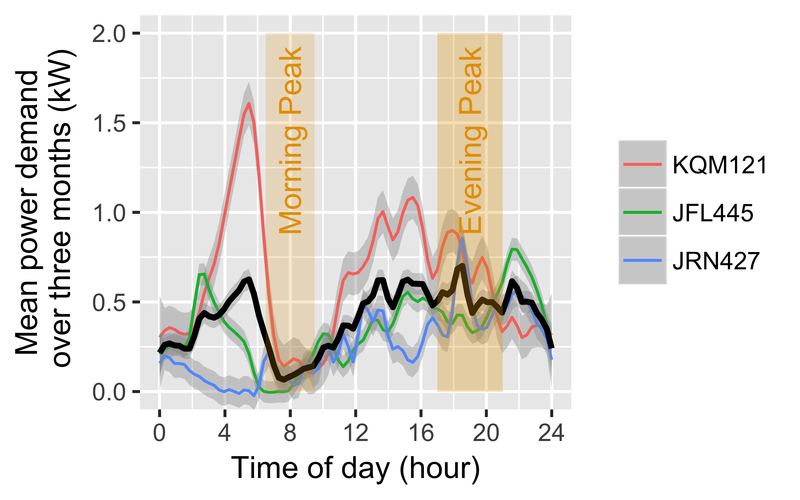 Figure 1: This graph show when in the day Henrik, Dima, and Daniel charge their battery. The heavy black line is the average. Gathering this data from a lot of people using our EV black boxes will help estimation of the impact of the national EV fleet on the electricity grid. 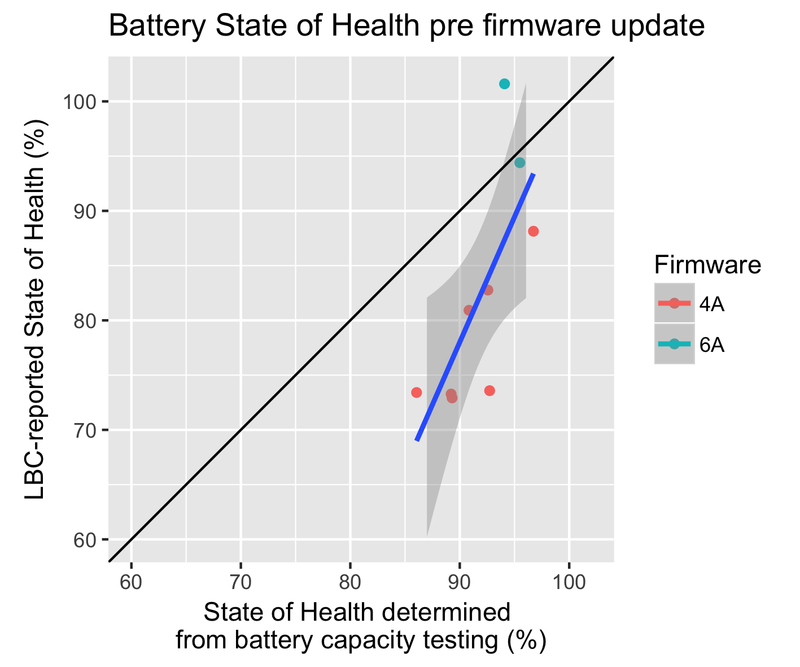 Figure 2: Battery State of Health (SoH) as a function of odometer. There is large variation in SoH, especially with sequential fast charging. Even when only slow charging there is still variation on the order of 1-2%. Our September 1-click survey suggests that if you can just get the customer to take a test drive, the EV is very likely to sell itself. We asked you what information was the most important for making their own decision to go electric. Almost a third (27%) were most persuaded to buy an EV by taking one for a drive. A hands-on experience of the quiet, smooth and peppy ride is often the clincher. So, Better NZ Trust and all those of you out there giving people drives at their events … take a bow! As well as test drives, word of mouth was a key influence – many buyers (19%) put their trust in the testimony of people like friends and family, or other EV owners before they switched. This is mainly where Flip the Fleet is trying to help most – to collect your experiences together and make those personal advocacy discussions more trusted for those that like numbers to back-up the feel-good experience of owning an EV. Some potential purchasers put in hours of research and relied most heavily on media (20%) or websites (15%) to check out EVs. Women are most persuaded by test drives, and younger purchasers rely more on websites and social media. There is no doubt that a lack of reliable information is holding back EV uptake in New Zealand. Only 13% of New Zealanders say they are familiar with EVs according to market research by the Energy Efficiency and Conservation Authority (EECA). You can read our full discussion of the results at https://flipthefleet.org/2018/what-information-most-helps-people-to-decide-to-buy-an-ev-1-click-survey-23/. 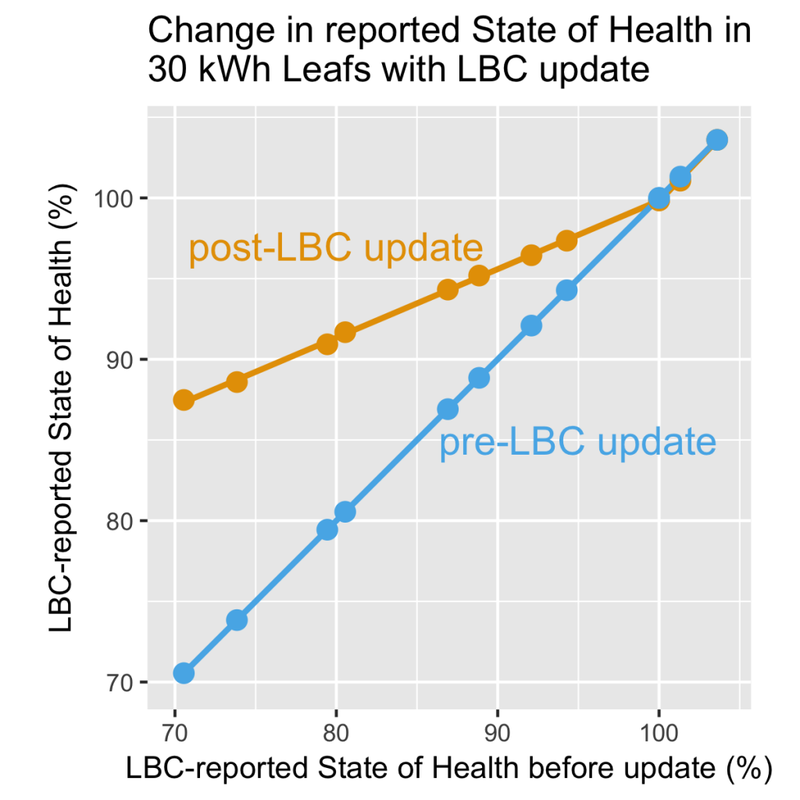 We commonly get people asking if they should be concerned about the State of Health (SoH) of the battery in their Leaf or eNV200 dropping by several percent just after they have purchased it. In many cases this is an expected result of the method of charging changing from primarily fast charging (very common in Japan) to slow charging. This is illustrated in Figure 1 below, showing how sequential fast charges cause SoH to increase, perhaps by as much as 8%. When slow charging is resumed, SoH then drops back down. 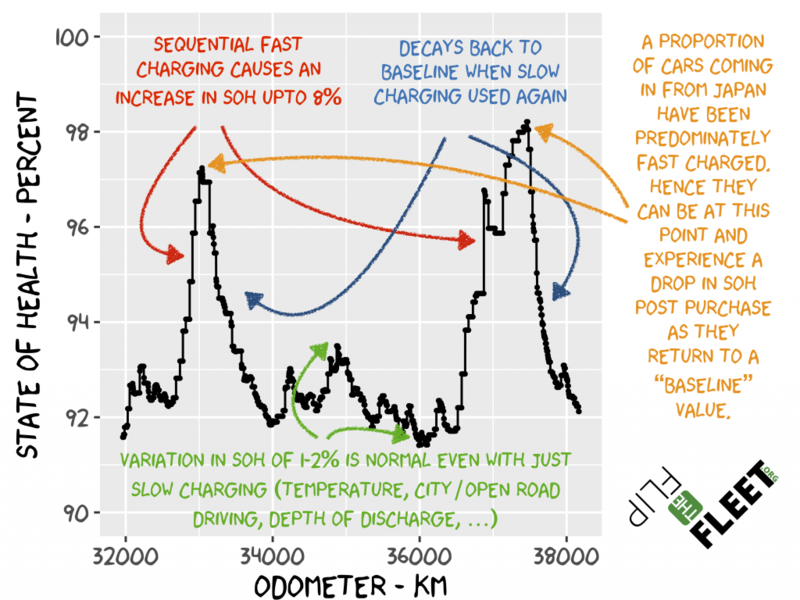 There is also often normal variation in SoH of about 1-2% even when the Leaf or van is continuously slow or fast charged. 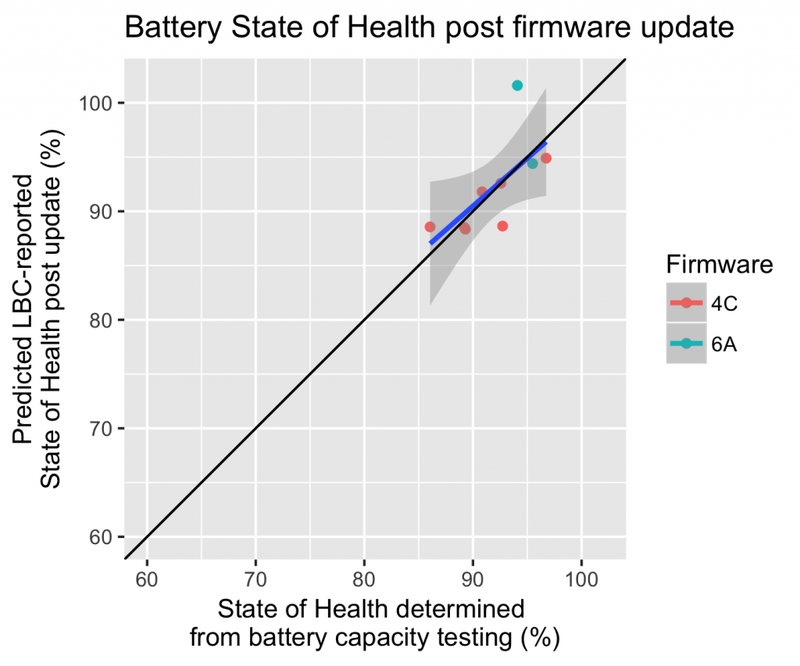 Figure 1: Battery State of Health (SoH) as a function of odometer. There is large variation in SoH, especially with sequential fast charging. Even when only slow charging there is still variation on the order of 1-2%. Hence if you do experience a drop in SoH following purchase, or see variation over time, this can be normal behaviour. When buying a car it can be useful to take into account that the SoH may drop by several percent post purchase if after a car with a certain SoH. Dear collaborators, It was a busy month! Here’s your September update from Flip the Fleet. Donald Love has braved a typhoon to represent you guys in Kobe, Japan, at the 31st International Electric Vehicles Symposium (http://www.evs31.org/). If you are interested in presenting for the coalition in the future let us know! 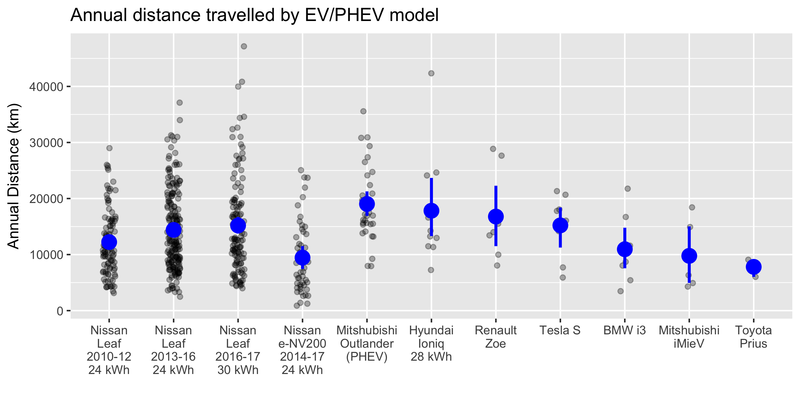 Our preliminary statistical models of annual distance travelled by EV model from all the data you have provided show some interesting patterns (Fig. 1). Over all EV models the average is 14,100 km/year, more than the NZ average of 11,500 km/year , and busting the myth that you can’t drive an EV anywhere much! There is huge variability, with one 30 kWh Nissan Leaf doing over 45,000 km/year, with others, such as several e-NV200 vans, doing less than 1,000 km/year. 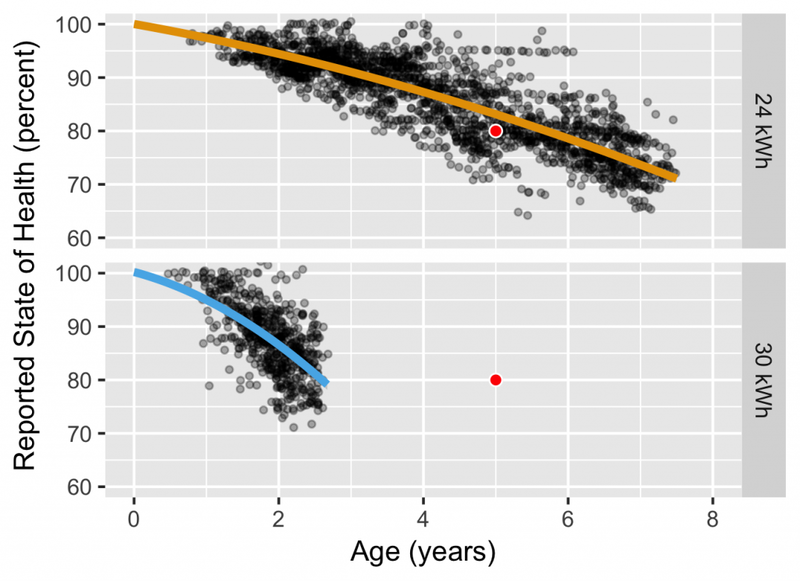 On average newer generation (1.3, 1.2) Leafs have higher mean annual distance than older generation 1.1 Leafs, and Mitshubishi Outlanders generally have the highest mean annual distances. Figure 1: Average yearly distance travelled (km) of different electric vehicles in New Zealand. The blue dot is the mean distance travelled, and the blue bars show the 95% uncertainty band. On the 9th of September, as part of Drive Electric week and in collaboration with the Otago EV Society, we held a ‘Hare and the Turtle’ event at Highlands Motorsport Park, Cromwell. It was a mix of citizen science, advocacy and fun. There was extensive media coverage, with the most prominent available at https://www.newshub.co.nz/home/politics/2018/09/calls-for-government-to-incentivise-owning-electric-cars.html – watch the video to see the outcome of the Ferrari versus Tesla drag race! We would like to thank everyone who helped with running the event, and all the EV owners who participated. A special thanks goes out to Curious Minds, ChargeNet NZ and The Better NZ Trust for sponsorship of the event. Over the next two months we will be presenting your results around the country. Come along to hear the latest results and ask any questions you may have. Flipping the fleet: accelerating electric vehicle uptake using citizen science. Henrik Moller and Monica Peters. Café Scientifique, Tauranga, 15 October 2018. 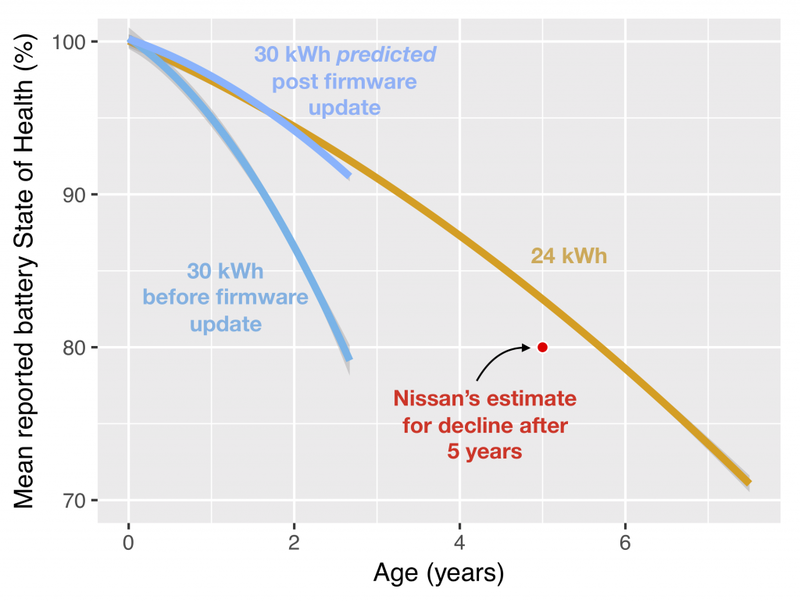 Flipping the fleet: accelerating electric vehicle uptake using citizen science. Dima Ivanov. Café Scientifique, basement dining room at the Horse and Trap, 3 Enfield Street, Mount Eden, Auckland, 31 October 2018, 6pm. Using citizen science to accelerate electric vehicle uptake in New Zealand. Henrik Moller, Dima Ivanov, Daniel Myall. Transport Knowledge Conference, Rydes, Wellington, Thursday 15 November. 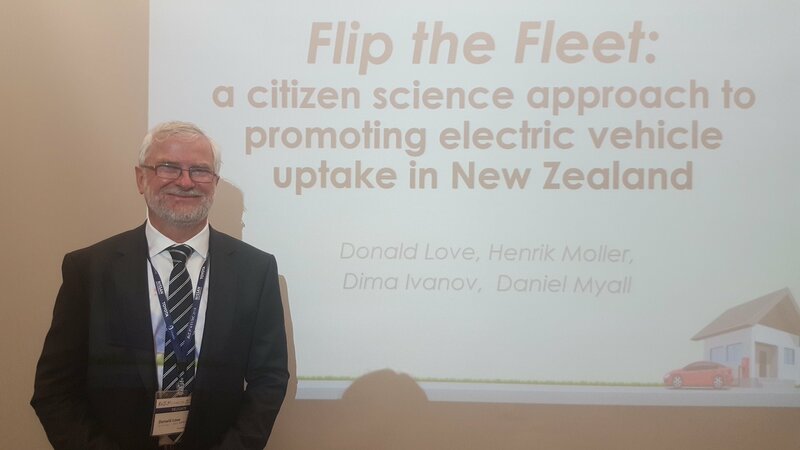 Citizen science for sustainability transitions: lessons from Flip the Fleet’s efforts to accelerate uptake of electric vehicles”. Daniel Myall, Henrik Moller, Hannah Gentle & Dima Ivanov. Field Research Centre, Lincoln University. Lincoln, 22 November, 12.30pm.